Few slices of fish fillet. Heat up oil and saute ginger and chopped garlic until fragrant. Add in the remaining ingredients and bring to boil.Dish up. 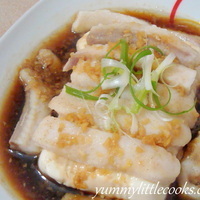 Arrange tofu onto a serving plate and put sliced fish on top. Steam at high heat for 13 minutes. Remove and pour away the excess water. Pour over the sauce and garnish with shredded spring onion on top and serve. We made this tonight and it was delicious. Our 4 year old had about 5 servings of the soft tofu. He loved it! This is a mild flavored dish that everyone will enjoy. We added a few shrimp because we had them and doubled the recipe and the sauce. I would recommend doing 1.5 times the sauce, as we ended up without quite enough to spoon over the tofu and fish. Overall, a great dish. We've added a picture of ours to the pictures. Thanks for sharing Cindy! Hi Cindy, I finally tried this recipe (the sauce esp) but had to use firmer tofu since they ran out of silky soft ones & instead of steaming I actually lightly fried it first before tossing in the sauce. It was a big hit with my husband. I also used fried onions & red chilies as extra garnish. Thanks! What fish can we use? Thank you. I'm going to try this soon! I love tofu & this is a simple dish to prepare. I'm going to try this really soon. This looks awesome Cindy! Thanks for sharing. I've saved it to the Try Soon folder in my recipe box and will let you know how it is!